The brown and pink colourway is much less common than the brown and blue. Bowl in pink, brown and blue, 9.5 cm high, 14.5 cm diameter. The blue iris-shaped flowers are beautifully shown in this example. Notice also the wavy rim of the bowl, which was intentional. Bowls were supposedly made 8 cm or 11.5 cm tall. However, handmade glassmaking is not an exact science since this bowl falls between the two 'official' sizes. A torpedo vase, in pink, brown and blue, 23.5 cm high, 6.5 cm diameter. Torpedo vases were made in three sizes: 13.5 cm tall (made 1983 only) and 23 and 32 cm tall (made 1983-1985). Torpedo vase 13 cm tall made 1983 only. The smallest torpedo vase is the least common of the three sizes. 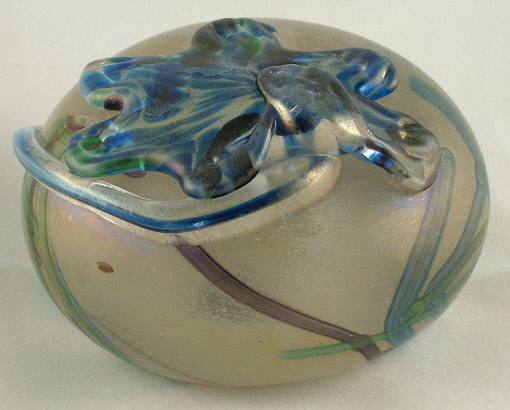 Blue flower paperweight, 8.5 cm diameter. 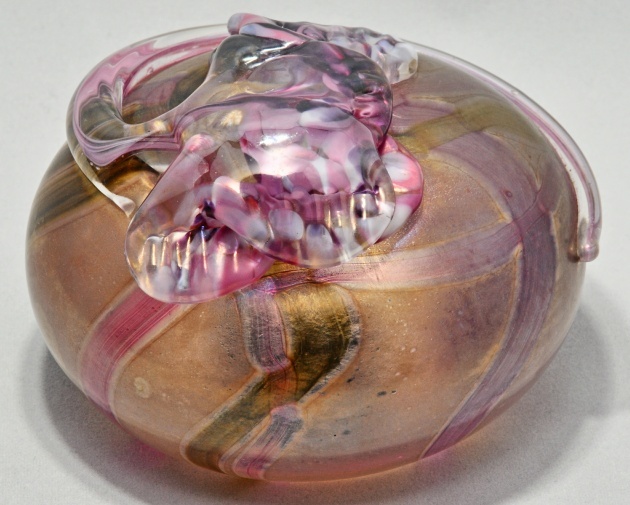 Brown and pink paperweight, 8.8 cm diameter, 6 cm high.